What Can #NOLASCHOOLS Teach Us? Michel Martin is hosting a conversation about education in New Orleans, 10 years after Hurricane Katrina sparked a transformation of public schools there. Add your voice at #NOLASCHOOLS. 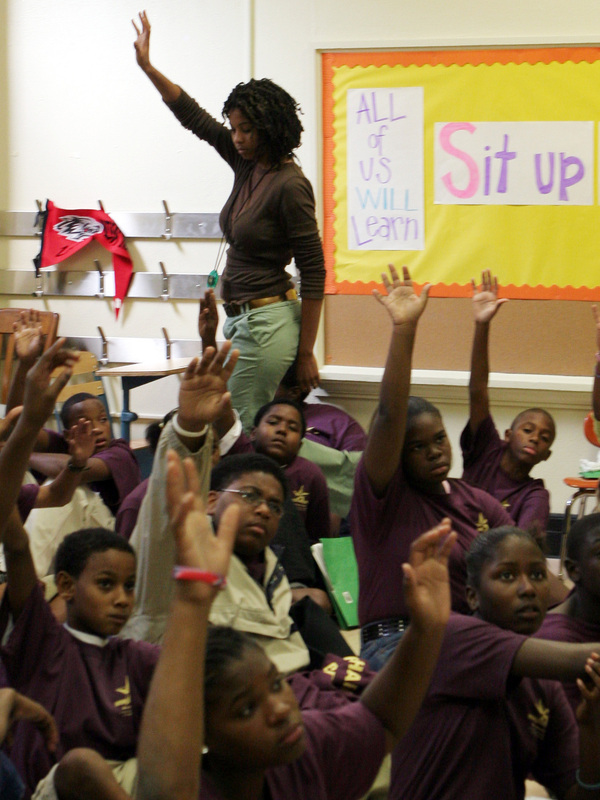 Teacher Towana Pierre-Floyd in her classroom at New Orleans West in 2005. It's a structured charter school set up for students and teachers displaced by the storm. What if you had to start your school system over almost from scratch? What if most of the buildings were unusable, and most of the teachers had left or been fired? Is that a nightmare, or your dream come true? In New Orleans, that was the reality after the flooding that followed Hurricane Katrina. That set off a chain reaction that transformed the city's schools forever, first by a state takeover and then by the most extensive charter school system in the country. Now some of the sweeping education changes that landed in New Orleans a decade ago are spreading all over the country. So we headed to New Orleans to ask about the benefits and the costs of the new education system, and whether one side outweighs the other. Tonight, in collaboration with member station WWNO, I will be in New Orleans to hear and share stories about what is working, what is not, and what lessons can be learned from the New Orleans education experience. You can listen to our live audio stream above and join on Twitter using #NOLASCHOOLS. I am happy that we have educators, parents, administrators and students with us to help lead our discussion, because they have deep experience in the issues we are going to talk about. Jamia Brown is an eighth-grader at Eleanor McMain Secondary School. She is a member of Kids Rethink New Orleans Schools, a nonprofit group organized after Hurricane Katrina to make sure that students voices are part of the education discussion. Sarah Carr has been covering education as a journalist for 14 years. Her book Hope Against Hope tells the story of New Orleans schools after Hurricane Katrina through the eyes of those most affected by the dramatic changes. She now leads an education reporting fellowship called The Teacher Project at the Columbia Graduate School of Journalism. Larry Carter is the president of the United Teachers of New Orleans. He began teaching in 1993 and has headed the teachers' union for the past seven years. This March, Ben Franklin High School in New Orleans approved the first charter school teachers' union contract since 2006. Patrick Dobard is the superintendent of Louisiana's Recovery School District and is responsible for the academic performance of over 60 New Orleans Charter schools. Some 30 school districts around the country are looking at the New Orleans charter school system as a model for education reform. Douglas Harris is an associate professor of economics at Tulane University in Louisiana. He also directs the Education Research Alliance for New Orleans, a nationally recognized research center focused on the city's schools. Aesha Rasheed is the creator and editor of the New Orleans Parents' Guide to Public Schools, an annual publication designed to help parents navigate the school offerings, judge school quality and advocate for excellent public schools. Joan Reilly is the principal of Homer Plessy Community School run by the Orleans Parish School Board. The school is located in the Ninth Ward and enrollment is more than 60 percent African-American — a demographic that reflects the make up of New Orleans as a whole. Karran Harper Royal works as an education advocate in New Orleans. She is the assistant director of the Pyramid Community Parent Resource Center. Her work at Pyramid involves providing one-to-one support to parents of children with disabilities and conducting workshops to help parents understand their rights under federal special education law. Victor York is a founding member of Kids Rethink New Orleans Schools. He hosts weekend science camps where youth explore engineering technologies such as 3-D printing, programming and computer science as a means to help their communities.